Watching the deeply moving movie Wit several years ago made me deeply appreciative of the work that nurses do. Among other things, the film reminds us that the most direct connection between medical care and the patient is the nurse. Her (or his) skill and compassion makes a world of difference in how illness and death is experienced. I recently finished reading Being Mortal by surgeon, professor, speaker, writer, husband, and father (a man with way more time than the rest of us) Atul Gawande. It is a deeply personal, well-written, and engagingly thoughtful book, subtitled “Medicine and What Matters in the End”. Gawande leads us through the tangled web of issues that confront us when we consider death and what leads up to it. I read it as a pastor but found that it would be a worthy read for any who expect that someday they might, you know, die. 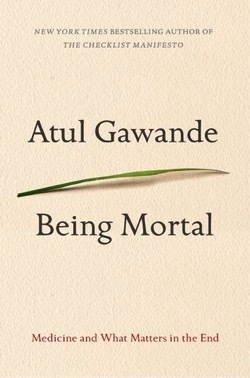 I especially appreciated the tour that Gawande gives of the line, the very thin and often imperceptible line, between decisions that prolong life and those that simply postpone death. If the hero of Wit is the nurse, the heroic role in Being Mortal is played by hospice. Hospice nurses and doctors navigate that line between life and death with greater insight and often a better hold on reality than the rest of us. In my experience, and that of Gawande, they humanize experiences that others make clinical. And they do it well. In thirty years of ministry when I’ve been in the presence of death, I’ve always found the presence of hospice to be deeply comforting and an indispensable blessing. And so, when I finished reading Being Mortal, I had to, once again, pass on my appreciation to my daughter who is, to be precise, a hospice nurse. The point for readers here is not my daughter, as it is for me. The point is to watch the movie, to read the book, and to be pointedly grateful for those you know whose work and calling bring them to the side of those who need them when, in life and death, they need a humanizing touch.